Originally a very old trout fly ( probably first tied in the early 1800's ) for Scottish Loughs, it was changed by me, on the suggestion of Ray Robinson, into a somewhat strange or even monstrous looking thing; but never mind: it catches salmon, especially later in the season. 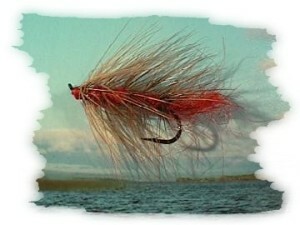 The Soldier Palmer works well as a tail fly and can be fished pretty deep. For our salmon, it turned out, there are only two sizes really worthwhile to tie a Soldier Palmer on: single salmons 4 or 6. Where Eanybeg and Eanymore meet, the two rivers have washed out a short deep pool; a good place to try for a salmon. I was fishing that stretch very thoroughly and of course just in front of me a silvery grilse showed. Taking line shorter to recast for him was an automatic reaction. My flies, Shrimp and Black Widow came around great, the water was just right, it was an overcast day and the bugger should have taken it. Anything showing? I lifted my glance from the water to the other bank. A man with white waders, rubber-coat and an ancient, blue "Adidas-bag" stood beside a maybe 12 year old girl who carried the landing net. Both looked at me smiling. Yes, I replied, you see them every now and then, but they are just not taking. The man asked smiling whether I had any objections to him fishing a little bit further up the pool. Not at all! I shouted across and they vanished behind a few bushes. The rod-tip and the fly line sailing down to the water was the only visible sign of them. I wanted to concentrate on my fishing again, when the girl came around the bush, dipped the landing net into the calm water at the edge of the pool; shortly after that, I saw white waders coming down the river. The rod bent he was playing a nice sea trout, which the girl landed skilfully for him. Both smiled at me and vanished behind their bush. Again there was only the rod-tip behind the bush and the fly line on the water visible. Then there was a short tug and a boil. This time it was something bigger. The girl came around, dunked the net into the calm water and waited for the fish. But it went up river, splashed at the surface and was free; a grilse, about 6 lbs. I guessed. The girl walked back up behind the bush, after showing a friendly smile, but came back immediately: a sea trout again. That is not possible, he has one fish after the other, and I am standing here like an idiot doing casting exercises. I shouted across: what are you getting them on!? On a fly, came as answer. I see that, but which one? A small brown one, and they vanished, smiling, behind the bush. A brown trout and a sea trout came next. I had enough and walked down to the bridge, where Neelie the water-keeper was observing the scene, do you know him? he asked pointing to a black van, parked at the road-side. No, my rage well under control, he fishes there behind that bush on the far side and catches one after the other. Neelie shook his head in amazement, is that true? It was true, because the girl appeared again with her landing net. Must go down and see, maybe he hasn't even got a ticket. From the bridge I could see the well known water-keeper hurrying along the bank, arriving at the place just in time to see the fish being returned. That is the fairest man I've ever seen fishing this river, reported Neely later, he's put a salmon of at least four pounds back in again, just like that, said it was not big enough. On which fly? I wanted to know. He makes them himself, that's what he told me, uses bits and pieces he finds around the house; now, it looked a bit like a Fairy Brown. Fairy Brown! That isn't even a proper salmon or sea trout fly, that is a lousy brown simple or something! thinking of my salmon flies, tied with so much effort and finesse. Exactly a fortnight later I cycled down to the Eany River again. The black van was already there. Today I'll show him! He was on his own this time and fished of course his spot behind the bush. So I walked up the other river. With the first cast a good fish followed my wonderful Shrimp-fly; a big swirl was all that happened. I changed flies after a couple of casts, tried to get that salmon on a silver doctor, but could not move him again. Anything happening? Mr Fairy Brown stood suddenly beside me, must have crossed the bridge without me noticing. A good fish rose to my fly, but didn't take. Why don't you try it and I'll go up river a bit. I didn't get far, hupp! he shouted as the fly was taken and since his net was a bit small for such a fish, ( though he later claimed to have successfully landed 15 pounders with it ) I gaffed for him, and saw this red thing, this red fly in the salmon's mouth, what is that!? Again such a thing you haven't even heard of, and so simply made, it can't be true; I swallowed a couple of times, smiled bravely, congratulated and promised myself, from here on in Fairy Brown and Soldier Palmer will become essential parts of my Fly assortment: don't despise the inconspicuous.